Kaoruko Mochizuki is quietly tending her herb shop when in walks a tall man in a dark suit claiming she's heir to the incredible powers of the Witch Queen... Who is also her mother... A mother Kaoruko thought was dead yet only slumbers until her power can be reclaimed. Aside from relentlessly dodging Harry Potter jokes ("You're a wizard, Kaoruko." Yeeaaahhh, I'm the only one laughing...) this manga is beautiful. The style is perfect for the magical fairy tale the narrative is promising. 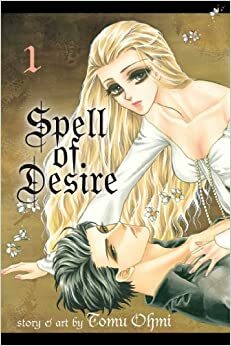 Long, flowing hair, glittering eyes, magical kisses; all the makings of a classic girl's manga; complete with transforming pets and the brooding guardian, Kaname Hibiki. Watching Kaname and Kaoruko stumble around one another is fun but I can see it wearing thin after a few volumes of it if the plot doesn't progress fast enough. As lovey as the couple is, the main question of what will happen to Kaoruko once her mother wakes up is what will get me to pick up volume two. Will her mother return and devour her? Will they have to fight? Will Kaoruko become the new witch queen or gladly give up her power since it's causing her nothing but trouble anyway? Aside for a few shojou cliches (if you've seen 'em before, you'll see 'em here... It is from Shojou Beat, after all), this is a good start to a series. I am interested enough to want to see what happens next.